Emmett, Idaho, July 14, 2018 -- The Boise National Forest has declared a prescribed burn, originally ignited April 24, as a wildfire in order to be more competitive for fire resources and allowing a wider variety of tactical options as they continue full suppression actions. Pockets of smoldering heat in heavy fuels, combined with recent warmer weather, have resulted in a creeping fire that is causing smoke to settle into nearby Crouch and threatening to grow outside the project boundary. The Lodgepole Fire is now approximately 1,600 acres and 25 percent contained. 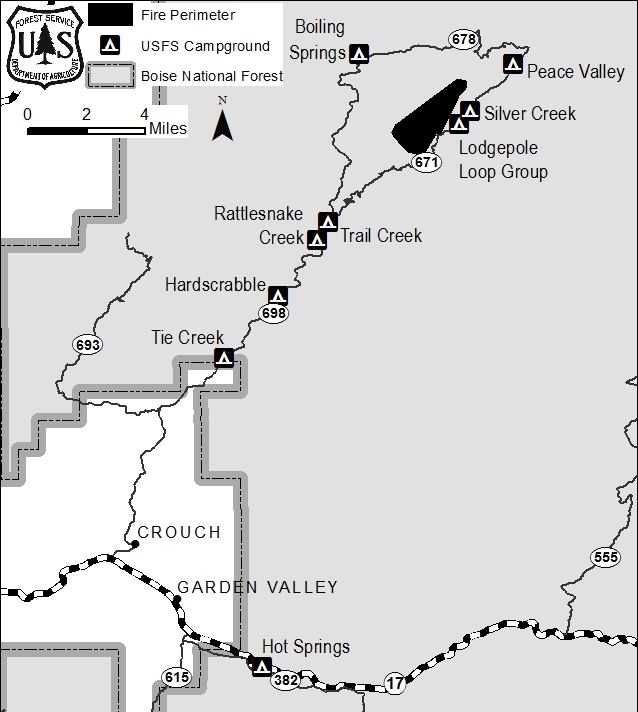 It is located about 14 miles north of Crouch along National Forest System (NFS) road 671. “We have been actively engaged in fighting this fire for about two weeks now with all of the resources at our disposal, but with the anticipated future weather, difficult terrain, and challenges obtaining additional fire-fighting resources, I have decided to declare this prescribed burn a wildfire,” said Emmett District Ranger Richard Newton. “To date, the fire has remained within the original planning unit and we are doing our best to keep it there. Declaring this burn a wildfire will give us more tools to ensure the fire stays where it is supposed to be. There are approximately 113 firefighters on the ground and are receiving support from three helicopters. Their strategy is to use direct attack on hot spots within the project’s interior and to construct and reinforce fireline to limit the fire’s spread. There are currently two temporary spur road closures in the vicinity of the fire. They are NFS road 671B1 and 671A, both of which are signed on the ground. An area closure will likely be placed in the near future, within the fire perimeter, for public and firefighter safety. The public is asked to be mindful of fire traffic on the 671 road to Silver Creek Plunge. 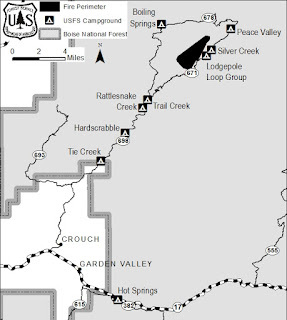 Silver Creek Plunge and campgrounds in the area remain open.